Lexcode Inc. sponsors the much-anticipated LES MISÉRABLES, a world-renowned Broadway classic by Victor Hugo. Win two (2) tickets to this special blocked screening as well as other awesome prizes! 1. This contest is open to Metro Manila residents, or to those willing to watch LES MISÉRABLES at the Shang Cineplex of the Shangri-La Plaza Mall in Mandaluyong City. b. Through a Facebook Note - if you don’t have a blog. Make sure that this is set to PUBLIC. Tag Lexcode Inc.’s Facebook Page: http://facebook.com/lexcodeph & Vintersections' Facebook Page: http://facebook.com/Vintersections (tagging is only possible if you have already LIKED the pages). Make sure this status post is set to PUBLIC. If your status post is in PRIVATE mode, your Lexcode Inc. tag will not appear on their wall. 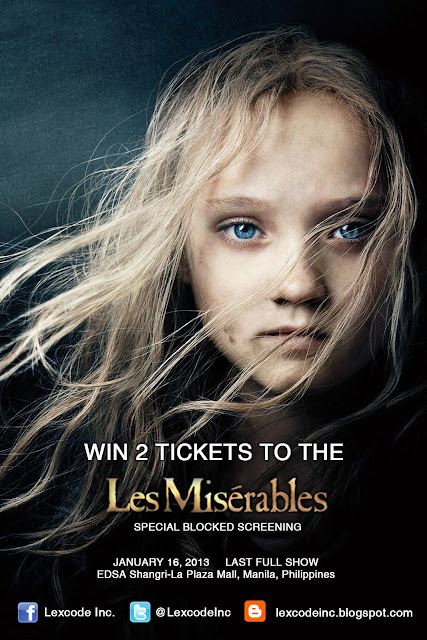 For your Facebook note, use the title, “Lexcode’s Les Miserables Blocked Screening Contest Promo (January 16, 2012)." Please include this line anywhere in your starting paragraph, “I’m joining Lexcode’s Les Miserables Blocked Screening Contest Promo, showing on January 16, 2012 (Wednesday) at Shang Cineplex, Shangri-La Plaza Mall.” You may modify this sentence. Make sure this Facebook note is set to PUBLIC. Then post your Facebook Note URL on your own wall, indicating that it is your entry to the Lexcode’s Contest Promo. Tag the following Facebook Pages: Lexcode Inc. and The Intersections & Beyond. 9. Only complete entries will be considered VALID. Total valid points are 35. 11. Deadline of entries will be accepted until 6:00 p.m. of January 12, 2012 (Saturday). 12. Entries will be checked by Lexcode officers and staff. Winners will be notified through E-mail / Facebook / Twitter on January 14, 2012 (Monday) on how to claim your prize in case you win.